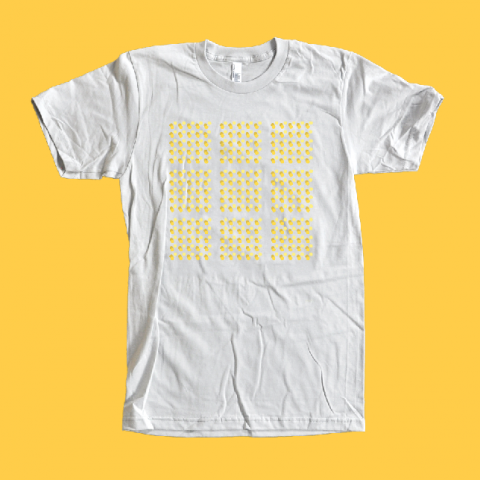 The OCD (Obsessive Compulsive Disorder) Tee is part of a series of shirts by Living With:, by Dani Balenson aiming to destigmatize mental health through accessible design. Each shirt is screen-printed with a geometric design that visualizes the behavior patterns of bipolar disorder, depression, OCD, and ADHD. With the design being abstracted, it’s a private-but-public way for the wearer to be empowered and feel good about themselves. Also, $2 of each sale is donated to Active Minds, a fantastic non-profit that’s working to change the mental health conversation on college campuses across the nation. also, what’s up with not ironing your wearz before product shots? i find these highly insulting. no person with any of these disorders would want to wear these. The first issue I have is the impression that they are turning mental illness into some sort of trendy commodity just makes me feel pretty weird tbh. I am saying this all from the perspective of a sufferer of Panic disorder and OCD and I am also a illustrator/designer myself. I feel that as a business idea is pretty tasteless. The way they compare it to wearing a tshirt that shows who your favourite band or cartoon is, like, really? And the fact that in therapy a huge part of getting over a lot of illness’ like depression, ocd and anxiety is to stop rumination as a thought process, to stop obsessing over yourself and your thoughts! Surely wearing a tshirt which displays your illness is a constant reminder, therefore a total contradiction, and not helpful at all! I have/suffered just wouldn’t dream of wearing a t-shirt like that. And lets not forget only $2 from $24 goes to charity. That’s a pretty big chunk of cash for these guys to be cashing in from, based on others bad times, they say ‘to spread awareness’. If they really cared to spread awareness, I don’t think they’d be charging $22 for the pleasure! Working in design myself and I know how easy it is to get wholesale these days. Does anybody behind the making of these shirts live with a serious mental illness? These shirts are ridiculous and don’t serve any other purpose than seemingly raising your profile while lining your pockets $2 out of every 24? As a m.a.d.d and panic disorder sufferer I find these t-shirts patronising, opportunist and overall insulting. Oh and I’m your target market, in case you thought I wouldn’t “get” it. Hey Ben! This is Dani, the founder/designer. As someone living with severe ADHD, I created the project to promote pride/self-acceptance for something that’s really difficult to handle on a daily basis. The goal is definitely not to be insulting or patronizing. I’d be happy to tell you more about the reasoning, goals, and the Active Minds partnership, so shoot me an email at [email protected] if you’d like. Thanks! To say that these shirts are offensive or patronizing gives the shirts far more power than they deserve. These shirts are merely graphic representations of disorders. They are diagrammatic, as opposed to persuasive or compelling, and don’t possess the ability to make a statement beyond what the disorder should look like. To me, that’s what initially caught my attention, that they visualize and distill down a complex behavior into something as simple and approachable as a graphic. But in regards to their power or message, the power behind these shirts lies not in it’s content but in its context — the intent behind how it is worn. To someone with the disorder, wearing a shirt that embodies that disorder could be a means of making it tangible, creating an object that exists physically to be utilized by the wearer. The shirt can become a symbol of control, of strength, of awareness. To someone else, wearing the shirt can be a symbol of support, of community, of progress. You could argue that the graphic becomes a label for the wearer, but even that label, if that is even the intent of the wearer, could be interpreted in any way. The symbolism behind the shirt is unique to the intentions of the wearer, and clearly Living With’s intentions are nothing but positive (see http://www.livingwith.co/#about). I find these shirts to be really interesting because of how they make the invisible visible, and through its application to a t-shirt create an opportunity for outward expression/conversation rather than internalization, with the added bonus of directing some of their profits to a good cause. Thanks Ben. I couldn’t put my finger on it when I first read this post. The words that didn’t come to me were patronizing and opportunistic, thanks for saying it. And yes, the whole notion of these t-shirts is plenty insulting. I am getting really tired of designers doing “Good”, but really just lining their pockets and raising their profiles in the name of some convenient cause. They undermine all the professionals who are truly working on solving actual problems. Dani, just saw your post after I posted mine. Sounds like this is definitely not a convenient cause for you. My apologies for generalizing. How do you see this as a stint to make cash? T-shirts are no cash cow, and the shirts aren’t sold at a premium price or as a premium product, and that’s all the while diverting ~10% of sales to a non-profit. They can’t capitalize on the cause behind the product when the product isn’t sold at a premium price. These are shirts that promote awareness and create support financially and behaviorally for a problem that a large population, 46.4% of American adults (again, see http://www.livingwith.co/#about) is dealing with, at no extra cost than any other t-shirt. Where’s the insincerity? As someone with his own experience with mental health issues, I find it a bit insulting that you feel the treatment and research of mental health issues is just a “convenient cause”. Perhaps you’ve been burned in the past by people trying to capitalize on “trending” causes before, but this is real and real good can come out of it. I think people are taking this the entirely wrong way. We live in a country where people are ashamed to admit that they struggle with mental illness. Many people consider disorders like depression and OCD to be less legitimate than other illnesses, yet they can be just as crippling and debilitating as any other “real” illness. An outlet to express yourself and show support for a loved one who has mental illness is a great thing, and these shirts provide that exact outlet. It is of course well within your right not to wear or purchase a shirt, but why not give a cool, well-designed product a chance. People with mental illnesses cannot simply put a pink ribbon on their car- the stigma in this country is too overwhelming. Any product that helps reduce that stigma is a great one in my opinion. And the fact that it also donates part of profits to a great cause is icing on the cake. Btw, I have lived with and suffered from depression for many years and have purchased shirts for myself and my family. Michael and Dani, I clearly just reacted before taking a closer look at the project itself and I agree that the way we handle mental illness in this country leaves a lot to be desired. Dani, I absolutely love your work and loved seeing it on a blog I read regularly. I think this series is fantastic and and am continually impressed by your clean yet powerful approach to design. Congrats girl, can’t wait to see what’s next! the t-shirts are lame, and the justification is BS. Obviously the OCD grids should be 4 x 4’s, not 5 x 5’s! *Sigh* now I’m gonna have to spend the next 15 minutes tapping out things in 4’s to make this right. to be on thee net the easiest factor to take into account of.